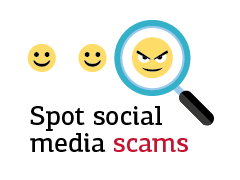 During this year’s National Consumer Fraud Week (15 - 19 May), Scamwatch is providing advice to Australians to help them ‘spot social media scams’. Increasing numbers of Australians are encountering—and losing money to—scams on social media. If you use social media, we encourage you to be particularly alert for dating and romance scams and fake trader scams. These scammers abuse the trust of social media users by pretending to be real people looking for love or legitimate retailers, creating emotional distress for their victims and financial losses that are usually impossible to recover. Don’t share personal information or send money to someone you’ve never met in person. When using retail websites, find out exactly who you are dealing with. If it’s an Australian company, you’re in a much better position to sort out the problem if something goes wrong. When making online payments, only pay for items using a secure payment service. Don’t use unsecured transactions like wire transfers. If the product doesn’t arrive, contact your bank or financial institution as soon as possible. Be careful who you connect with and don’t accept invitations from people you don’t know. Report profiles you suspect to be scams to the social media platform – they might be attempting to scam others too. Review your privacy and security settings on social media to ensure you stay safe. 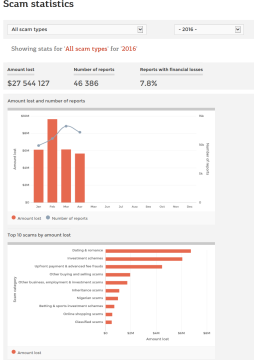 Take the time to understand exactly what your account shows about you to the public. 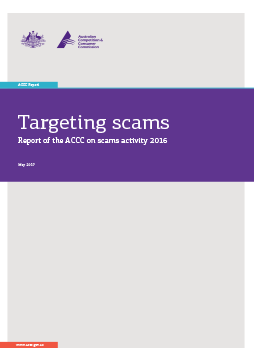 Targeting scams: report of the ACCC on scams activity 2016. This report explains key trends in scam activity and highlights the impact of scams on the community. It highlights the cooperative work of the ACCC, other regulators and law enforcement agencies to disrupt scams and educate consumers. 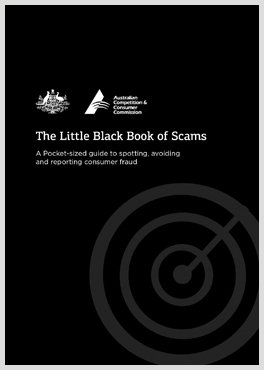 The little black book of scams. This ACCC publication can help you learn more about scams including the most common scams to watch out for, the different ways scammers can contact you, the tools scammers use to trick you and the warning signs to look out for.. Dating and romance scams. Learn more about how these scams work, and what to look out for so you can protect yourself from dating and romance scams. Online shopping scams. Find out how to identify scammers pretending to be legitimate online sellers, either with a fake website or a fake ad on a genuine retailer site. Latest scams information. Sign up to receive Scamwatch radar alerts direct to your inbox or follow Scamwatch on Twitter. This infographic provides a snapshot of key trends in scam activity from the 2016 Targeting scams report. Scamwatch and the Australian Consumer Fraud Taskforce would like to acknowledge the assistance of our government, business, and community group partners for the 2017 Fraud Week campaign.